momstown Winnipeg: Let's Make Music at our Tales for Tots! momstown has exploded here in Winnipeg! Our Tales for Tots is getting very popular! In less then three months we have gone from 3 mamas at our first ever meet-up to 16 moms and their kids/babies at our August Tales for Tots (and that was still after last minute cancellations due to sick kiddies)! It got a little noisy as our theme this past month was 'Let's make music!' but we had a blast! We switched things up this time and did our craft first. Since we planned on singing songs during circle time and our craft was decorating maracas, it only made sense to get those shakers ready for some music! 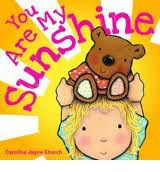 Scholastic Canada provided us with two board books this month, You Are My Sunshine and The More We Get Together, by Caroline Jayne Church. We sang our books this time around and the kids had a blast! 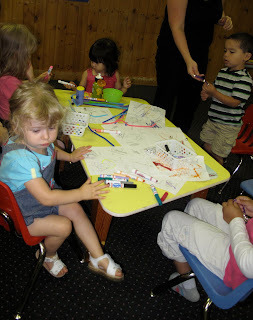 We also sat around and sang lots of out fun nursery rhymes. The kids helped pick out some songs and we practiced shaking our new instruments! If you missed our event, you can read our momstown.ca review about these books. Getting ready for circle time! 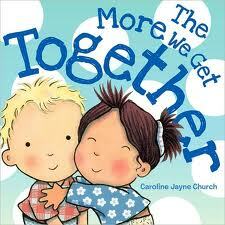 We also gave away each book to 2 lucky moms & their tots! Congratulations to Michelle and Nadine! Looking forward to this month's Tales for Tots, as we'll be reading The Underpants Zoo by Brian Sendelbach.